There are few artists that will ever make quite the same cultural impact as David Bowie. Whether you listened to his unparalleled back catalog of tracks growing up, were a fan of his turn as the The Goblin King in Labyrinth or take your fashion inspiration from his Ziggy era costumes, it’s impossible to deny the influence Bowie had on a generation of creatives. Released just days before he died, Blackstar was a touching farewell to his fans and a heartbreaking insight into his final few months as he privately battled liver cancer. 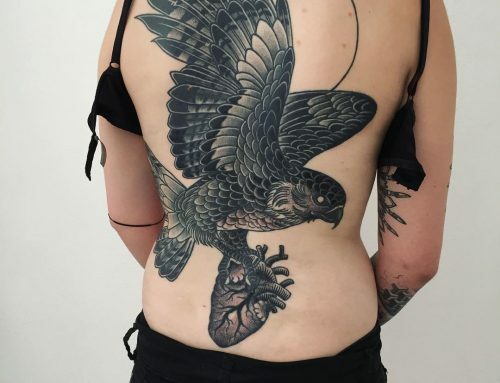 This album was also praised for creating some of his most striking visuals in recent years. As iconic as The Rolling Stones Tongue and Lips logo, the Aladdin Sane lightning bolt is one of the most iconic visuals to come from Bowie. 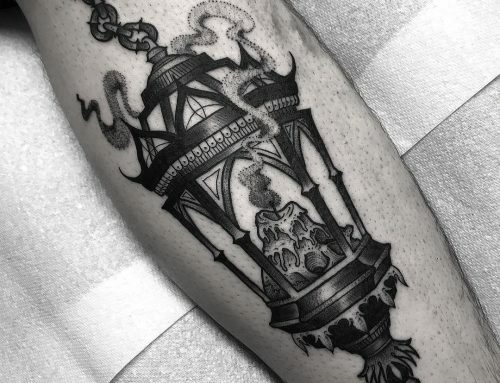 Whether you want a neo-traditional or illustrative style tattoo, the classic bolt can be adapted to a truly unique piece of work. 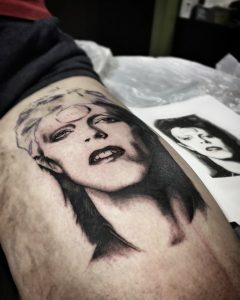 Space was a big theme throughout Bowie’s work and can be incorporated into a wide range of different tribute tattoos. 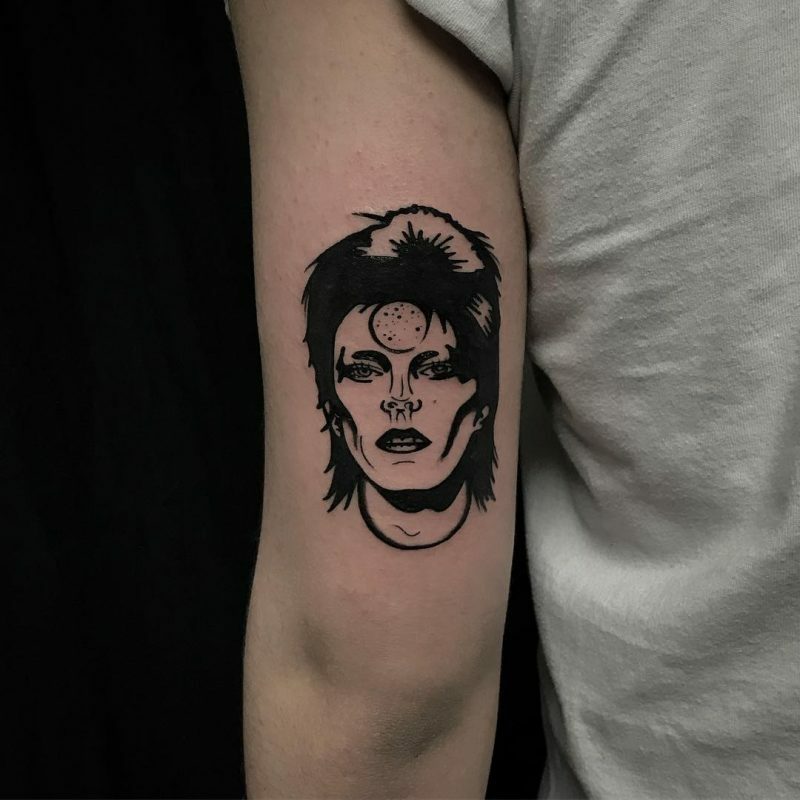 Songs such as Starman, Space Oddity, Life on Mars?, and Ashes to Ashes can all serve as a great starting point and offer up great lyrics that can also be used for a simple quote tattoo. Arguably his best era, Bowie’s alter ego Ziggy Stardust changed the face of Rock and Roll forever and you can still see the influence of this persona in the pages of iD and Dazed and Confused today. 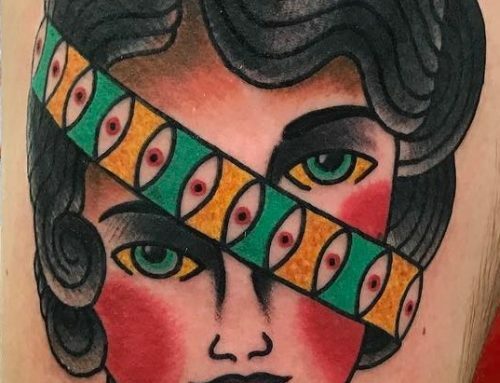 Some of his most theatrical and visually stunning portraits come from this era and would make beautiful realistic portrait tattoos. 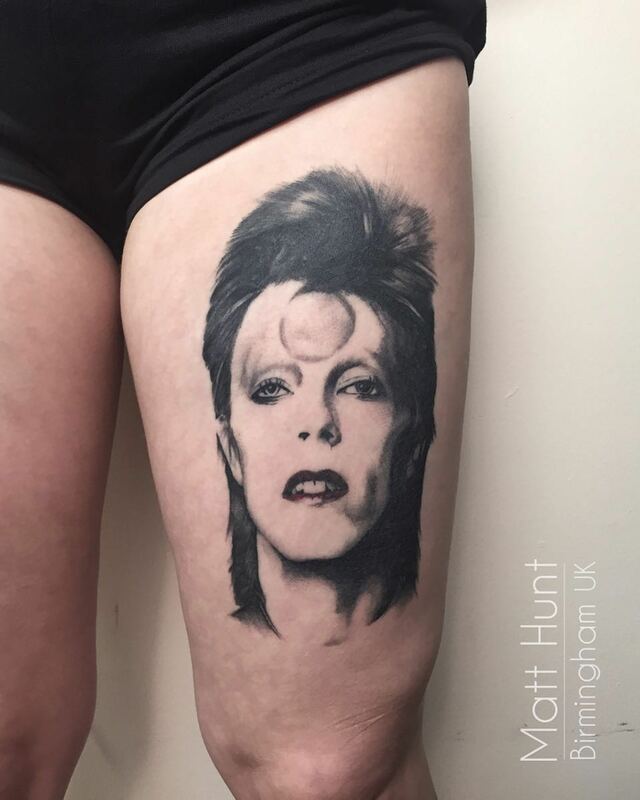 David Bowie portrait tattoo by Matt Hunt. Let’s face it, there’s no shortage of design ideas for your very own David Bowie tattoo. Get in touch today to discuss your ideas.